Are you looking for the best PC joystick? This buying guide hopes to aid you in choosing the best joystick for PC exactly for your needs and budget. It’s been a while since the early 1990s when the first space combat games came out and joystick designs ruled in the PC flight simulator community. Most gamers until recently had little need for a flight stick since good flight and space simulator games had become somewhat uncommon. But the online FPS community is moving beyond Battlefield’s attack helicopters or the classic simulators, and titles such as Star Citizen and X-Wing/TIE Fighter are exciting a new generation of enthusiasts. When fighting in the skies way above a Battlefield map or planet, experienced gamers need every optimized lever and button to control their vehicles’ movements instinctively and accurately. HOTAS. This term represents the somewhat unexciting concept of “Hands On Throttle-and-Stick” action, where a dual-control design lets the pilot’s hands rest on both the throttle and the maneuvering stalk. Hat-switch. This is a multi-directional switch which works like many d-pads found on game console controllers. On flight sticks, this variant features either a 4- or 8-way “hat” switch atop the control stalk, which the user can readily manipulate with his thumbs to trigger various actions. In this test, we review seven of the best joysticks and give you our opinions on each to help you decide on which joystick for a computer to get. In case you’re wondering if only high-end expensive gear is covered here, one of the better models is found in the lower end of the price range. So without any further discussion, we now present a list of the best joystick for PC. We hope that you find the best PC joystick for your needs and budget. The following list of the best joysticks for PC is updated regularly to ensure that the list stays relevant and of high quality. We hope the list of joysticks above helped you pick the best joystick for PC according to your budget and must-have features. If you for some reason happen to be looking for the best controller for PC gaming instead, then be sure to check out our dedicated buying guide for PC controllers! The Saitek X-55 is it, although rival Thrustmaster’s top entry is the only reason we don’t point to this model as the best overall. Also known as the Rhino, the former is an upgraded X-52, which on first look appears designed to be more like Thrustmaster’s entry than its space-age predecessor. It does show more than a passing resemblance to a jetfighter’s flight stick/throttle stalk compared to the X-52’s slick design, which means it has a more functional look and usable feel. Saitek’s control scheme is nearly the same as the Warthog’s, even if it has one less hat-switch than the latter’s four. The swappable coil-spring sets allow the gamer to customize the frictional play according to his preferences. The throttle switch is the big deal, though, as its action operates smoothly and while playing its resistance can be modified to a broader extent than its rival. It offers a full complement of hat switches, mini-joysticks, and flip-up and dial switches for complete gaming. The Saitek X-55 is currently the best gaming joystick for PC at the current price point. Unfortunately, plastic materials and not metals like the Warthog’s steel abound in the X-55’s construction, which is why its stalk has less heft and the buttons feel less sturdy. 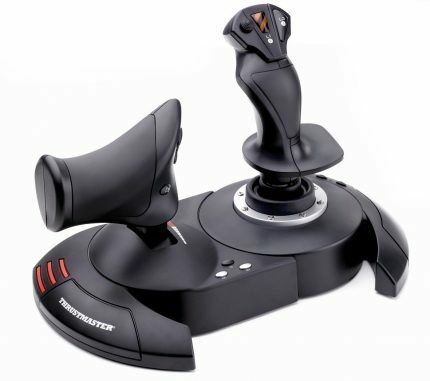 While Thrustmaster’s best flight stick is also significantly more expensive and it sure feels and looks the part, to be fair the X-55’s feature and quality set remains well ahead of the rest tested here. We find Saitek’s X-55 Rhino to be a great flight stick/throttle game controller. If not for Thrustmaster’s truly excellent Warthog, this model could have been our pick. You’ll know why Thrustmaster’s Warthog is worthy of being the priciest package the moment you begin to unbox the unit. What comes out is a collection of integrated metal enclosures for every major section, including the base’s body and the stick’s housing. That last module alone masses more than a kilogram by itself. The sheer mass imparts an impression of toughness, which can go a long way to reassuring you that it won’t be coming apart when pulled to-and-for as you’re slamming things in-game. Certainly the best joystick for Elite Dangerous, a popular game for PC joystick enthusiasts, and also generally the best joystick for PC games. The functional design bespeaks its robust construction. Thrustmaster recreated it from the real control set of the actual A-10 or “Thunderbolt 2”, the USAF’s premier ground-support aircraft. Its faithful heritage means it has a plethora of button and switch controls, and if form-is-function is your thing then it will be one of the more handsome controller units you’ll have the privilege of operating. As with Saitek’s offering, both the stalk and throttle housings feature a complete set of hat switches and flip-up/dial switchgear. As mentioned, this is the best PC controller and since it is Windows 10 compatible, we believe it is also one of the best Windows 10 compatible joysticks out there, if not the best. The adherence to a true-to-life design does mean that there are no Z-axis rotations using the control stick, which can be a sticking point for some. This is compensated for by the fact that most of the controls can be readily mapped to rudder-control functions. We personally think this is one of the best joysticks for Windows 10. It goes without saying that the mechanical actions of either the joystick or throttle cannot be easily faulted. The stick displaces evenly and predictably in every direction, and in-game translations are mighty fine as well. The level of resistance is sufficient to keep the mechanism from evolving too much play, although it does not have much stiffness. It’s great that the throttle’s resistance can be modified on the fly when needed according to how much or how little frictional force you’d like in its travel. We find its feel to be quite good and its mechanism works nicely. Its extended throw lets you better fine-tune the speeds of vehicles, providing a winning advantage when docking quirky vehicles and whatnot. You might think we’re going overboard by recommending a flight stick as ultra-expensive as this. But those gamers who follow trends know that no other model can touch it for now, which makes this the best PC joystick and certainly the best HOTAS for 2019. We find this pricey model to be an amazingly accurate and robust joystick that’s quite expensive but does provide top-of-the-line experiences. For those seriously involved in flight simulations or games like Elite, this is the absolute best among those available to consumers. Thrustmaster’s T. Flight HOTAS X shows that good-enough PC flightsticks don’t have to cost an arm and a leg. Although it’s designed and built to a far less expensive level of quality than its stable mate, it does cost almost a tenth of the price, for which you’d likely overlook the plastic construction and fewer numbers of button controls and hat-switches. The basics are still included, and the removable throttle is well thought out in that it allows a more flexible desktop arrangement for easier access to the keyboard. Having the ability to separate these input devices into surrounding clusters can really help. This is certainly the best cheap joystick. This model also features the desirable Z-axis rudder spin control, even though you can also move the rudders using rockers on the throttle grip’s front. There are plentiful programmable controls as well, but these have the kind of ordinary feel you’d expect on a value-priced joystick. The stick’s and the throttle’s mechanical actions aren’t as slick as that of high-end gear, and there’s a little grinding as the stalk is pushed about. It remains sturdy and still plays solidly in any game, and if you think the X-55’s or Warthog’s asking prices are too stiff then this well-designed model can be a great value-priced alternative. We find this to be very good gaming joystick for the price which with reliable performance and good features. Although it’s not in the same league as the top-end models it won’t disappoint and delivers quite a good experience, and is our choice for the best affordable joystick. You can see more of Thrustmaster’s joysticks here. It’s been a bit of a hurdle to figure out which models merit the designation of winning joystick for PC gamers. Normally the specifications and build quality can help us establish objective evaluations, but all the top candidates were each already good. In the end, it all came down to a more subjective appraisal of each model’s strengths and failings, and even though the following models didn’t make the cut, they can still offer good experiences. This brand may not be well-known to many sim gamers today, but the manufacturer has supplied a range of classic controller models as well as simulator consoles over the years. They mostly produce realistic simulators these days such as Cessna cockpit setups, and thus their models are designed more for functionality than style. Their products may not look pretty, but they do let experienced gamers prevail with their ugly-looking but fully functional layouts, even if they don’t fully look the part. CH Product’s best is a genuine joystick controller which offers the widest-ranging throw compared to the others tested. Very precise control of wing and throttle elements is the result, and its old-school X-Y axis control will enable you to swiftly yank the control stalk around in response to fast-changing situations, and there’s a throttle model that’s available separately. Considering its yaw and pitch finesse, its Pro Throttle module is something of a letdown. The grip’s feel is good enough and comes with a variety of hat switches and program switches, but its linear action doesn’t feel impressive. Whereas Saitek’s and Thrustmaster’s throttle sliders arc nicely with long travel, its mechanism slides on a flattened axis along a shorter distance. Given that the total price is much higher than that of the X-55, it’s not a combination we endorse wholeheartedly. We believe you’ll get more satisfaction out of the Rhino than from this classic pair. That’s not to say it’s a bad or middling controller for its stalk and controls are incredibly good, but the big cost can’t be justified with the Pro-Throttle included. We find the Fighterstick to be a bit high-priced and plain-looking gamer’s controller/throttle combo which greatly excels at classic maneuvering. But it’s not recommended in the presence of similarly excellent competitors with better throttle controls. 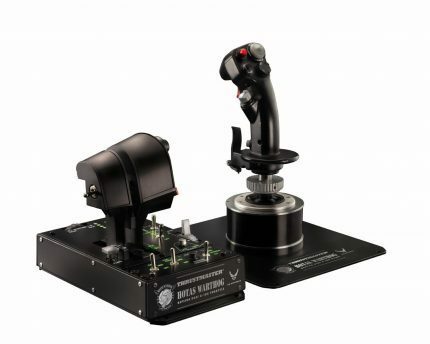 Saitek’s older model remains a successful joystick, its tall stalk can be fully extended in all directions while its broad base ensures that it won’t perambulate around your desktop during suspenseful dogfights. It has a good complement of buttons and a hat-switch that’s easy to thumb located atop the grip. But it isn’t comfortably held in your hand for long as it lacks the level of ergonomic refinement which the best designs possess. The throttle is not that well-located on the base, and although its location fronting the stalk may benefit left-handed players, it does so only at the cost of finicky finger operation. We still find the rival HOTAS’s features and quality hard to ignore in this price range, and although this joystick does the job, it doesn’t do it as brilliantly as its best rivals. Although this joystick is a good-value choice, it’s hard to suggest this over Thrustmaster’s budget HOTAS model which costs about as much. The housing of the base features thick buttons which might make you wonder about its design, but during play, they will serve your gameplay well. The throttle is not a separable unit but the control’s performance is quite capable, particularly in comparison with joystick controllers which feature only short and simplistic levels at the bottom of their housing. The Black Widow’s fat stick is actually easy to grip and the button controls are readily manipulated. Its traditional X-Y axis scheme allows for a good amount of throw in the stick’s movement and finer control of your craft’s yaw and pitch as you play. The trigger’s mechanism is a bit wanting as its unsubstantial button doesn’t offer you a good, positive pull. 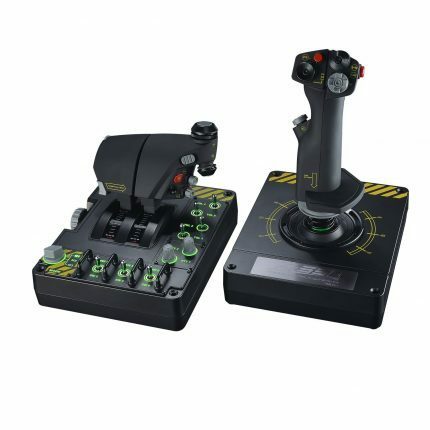 And although it features axis rockers similar to that of HOTAS’s at the front of its throttle, the absence of a more accessible Z-axis control scheme isn’t doing it any favors. Speedlink’s problem is that there are better models like Thrustmaster’s and Saitek’s which simply deliver more control features for the same price, such as the HOTAS’s removable throttles which offer big usability advantages. We find that this joystick performs well and has an efficient layout. It can still be an unexpectedly good value option in place of the pricier models, but the competition will be difficult to overcome. Logitech’s entry would be a competent flight stick but for an annoying design flaw: If you mash the stick forward hard enough, the hand rest will bite a little into your wrist, which can be unsettling when you’re trying to focus on outwitting your opponents. The tiny throttle on the base appears to be positioned for operation by your thumb while your left-hand fingers work on the half-dozen tiny buttons clustered there. It can be made to work fine with players good at articulate handiwork. But the comparatively miserly 90 degrees of revolution still doesn’t provide much travel for fine-tuned control, while the button cluster is a bit too crowded for instinctive selection. The stick’s crown is better designed, with thumb and trigger buttons mounted as well as four other switches surrounding the one hat-switch emplaced atop the stalk. But the hat-switch is slightly cumbersome to use as its indented surface cannot be quickly thumbed most ways with much precision. We find that this joystick can make for a very stable and predictable control platform, what with its short-throw grip and narrowly clustered switchgear. But its big advantages cannot compensate for its big design weaknesses. This PC joystick can be enjoyed to play the best games for joystick easily. If you are looking for the best joystick for PC and you have some questions or concerns, we’ve included this passage just for you. We hope it answers some of the questions you have regarding PC joysticks, and if not, let us know in the comments if you have a question. Can flight sticks can cost too much? 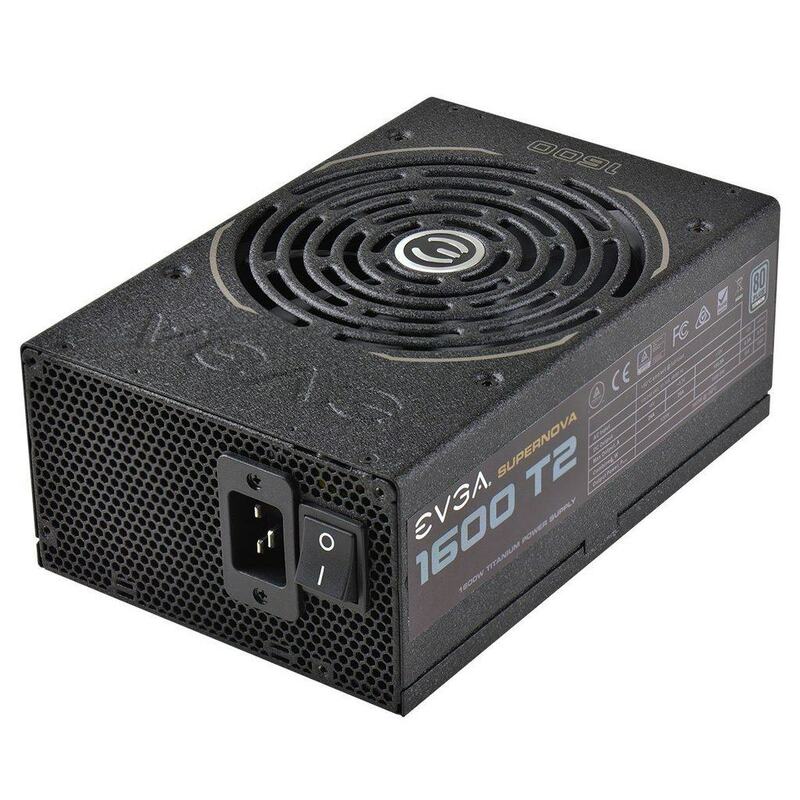 In place of getting a high-end flight stick, the money can be invested in the latest discrete GPU card to run graphically-intensive game titles. It’s possible to get close enough to a Warthog-level control experience for a bit less, though. 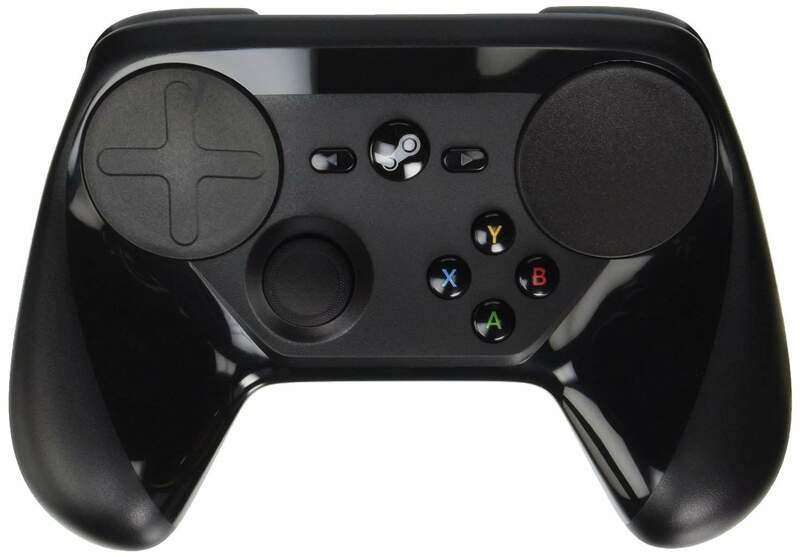 The list of alternative controller models following can help you meet your budget. But for earnest gameplay in a flight or battle simulator, you’ll be wanting to control vehicle throttles. The capability is what makes a flight stick superior to a mere d-pad, for the fine-grain manipulation of velocity that you can attain with joysticks in dogfights can make or break your advantage over your foes. Thus the first rule is to ensure that whichever stick you select, it must integrate a useable throttle. Not necessarily, although the more competent players look for respectable controllers which feature separate throttles in the form of additional control toggles and lights. A few like the AV8R integrate their throttles into the very base of the control stalk. It’s important that the control features a lengthy distance of travel, which allows for a greater span of power delivery and thus control of game vehicles. A lot of the controller models reviewed seem to offer too many buttons which can be programmed. Just the same, many simulator settings can use most keys and every controller button available, and having all the critical functions ready at your fingertips can make all the difference. For efficient tasking, you will want at least a 4 or 5 button cluster centered on the control stalk, plus at least one 4-way hat-switch mounted atop the grip. Classic flight sticks feature only controls to allow pitches and rolls, but the more advanced have a 3D control space which integrates an extra axis. So in addition to points along the X- and Y- axes, the presence of a Z-axis control scheme will let you rotate the stalk clockwise or the reverse, which your craft’s turning will mirror. This capability generally directs yaw by duplicating the operation of an aircraft’s rudders. Within a 3D game space, that extra dimension of control can really help with accurate heading and aim of vehicles, like when you are curving into an incoming missile or trailing a jinking enemy fighter. With flight sticks which offer other switches for imitating rudders, this may not matter as much. But when using cheaper models which forego the additional control scheme, the lack can be really be telling.